I finally added OAuth to TwiX, the Twitter-XMPP gateway. 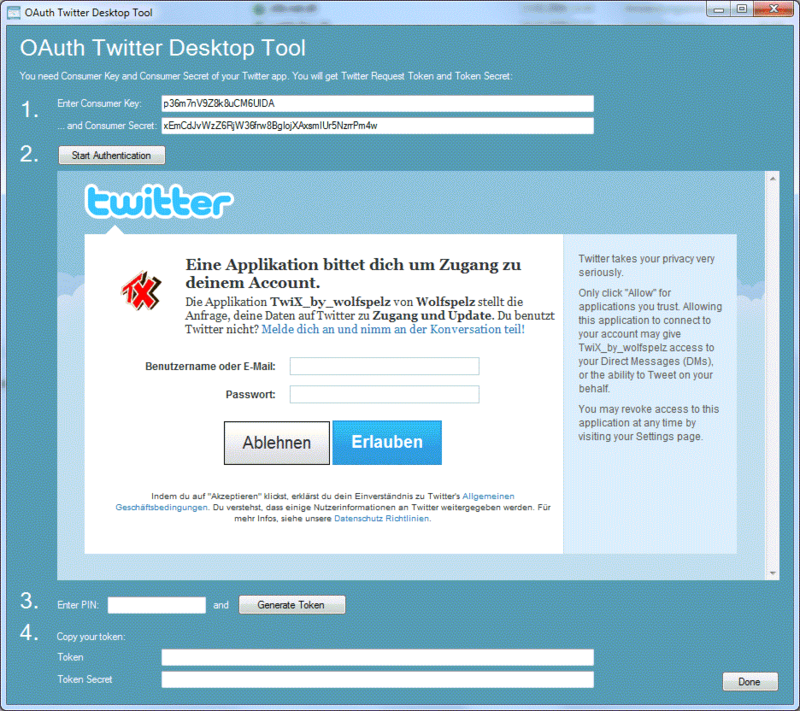 Since August 2010 Twitter requires OAuth for API access. This is extremely stupid for background daemons like TwiX which do not have a user interface and especially no browser based UI. TwiX is my C# playground. So, I needed an OAuth library for C#. TwiX runs on mono and .NET. I am running my instance of TwiX on a Linux server. Luckily almost all .NET libraries run without modification on mono. A quick research returned several OAuth libraries, some are for ASP.NET, which I do not use, because TwiX is a faceless server daemon, not a Web application. I zeroed in on Shannon Whitley's implementation which comes with a handy sample project. I used the 2 OAuth classes in TwiX and converted the sample desktop app into a Twitter OAuth token generator tool (see screen shot). 1 hour of work, thanks Shannon. This is a general Twitter token generator. It is not just for TwiX. 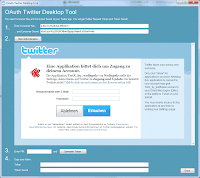 The OAuthTwitterDesktopTool generates a twitter token and token secret for every Twitter app, if you know the app's consumer key and consumer secret. The OAuthTwitterDesktopTool is part of the TwiX distribution. You can find TwiX with OAuth and the token generator on the TwiX homepage.